I have always been attracted to painting. If I chose to make films, in a way, it’s because it was more comfortable; a camera takes little space and film can be put away in a box and, when one lives in a 20 square metre apartment in one’s early adult life, there’s no question of putting up canvasses on the walls. This is a very prosaic introduction you would say, and it is true that besides these material aspects one can find other more noble and more profound reasons. I have always liked the cinema because of its immediacy. The light projected and revealed; painting has always fascinated me for its timelessness, there forever, independent of our existence – especially the paintings by Mark Rothko. I remember a large exhibition dedicated to Rothko in Paris about ten years ago. A profound revelation for me, I sat, almost two hours, in front of a painting to take in the colourful vibrations. At the same time (beginning of the 1970s) I was spinning Tibetan mandalas, kind of archetypal paintings, symbolic representations of the cosmos. I spun them around very quickly, and I noticed the surprising visual effects that took away any kind of representation to produce on their surface a series of colourful concentric circles. A friend and I had filmed these mandalas while they were rotating to accentuate the optical effects of colour with the cinematographic speed of the filmstrip. A little later, after Peter Kubelka’s trip to Paris, I filmed Film numéro deux (1976) that I always considered as being my first finished film, but the colour, the need of colour and abstraction, came to me only afterwards. After Film numéro deux and Couleurs délicieuses sur fond bleu (1976), I felt the need to channel that first energy that had given life to these two films in a spontaneous and instinctive way. I felt I needed to “organize myself” in a certain way otherwise there was a danger of repeating myself. And, in fact, with Organisations (1977) I integrated in a kind of analytical and reasoned way, what had been up till now immediate inspiration. Organisations consisted in inventing my own means of measure (a division of the photogram in vertical parts, combinatory distribution of colours and vertical strips). By measuring the film in my own way, I could redefine by myself cinema and how I thought of doing it, and therefore to reabsorb what had influenced me with my own practice. From Organisations to Holon (1981-2), passing through Trama (1980), these are “instruments of measure” that have changed, that have become more and more complex but, in fact, simplified in the sense of suppleness and fluidity in the colours. Simultaneously I continued to film in a more improvised and immediate way with Réseaux (1978) and Autoportrait au dispositif (1981) that, even if they are figurative, did not exclude work that had been done on the colour. In Réseaux, I introduced, with every rotation of the mask, a coloured filter to heighten the sensation of thickness produced by the condensation of several filmed passages on the same filmstrip. I chose to film Autoportrait with an old colour film and I obtained a greenish uniform colour, a coloured tint which gave the effect of time, just like old photographs which, worn out by time, lose their initial colour and freeze in a uniform tint. To come back to abstraction, I have a feeling that colour varies in my work between two aspects: the colour-object that comes from the sensation of an object, in this case the film strip, and the opening. 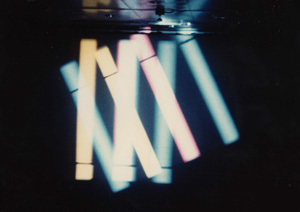 This colour-object permits the transporting of objects into space, to explore the space of the screen in the theatre; this is what allowed me to develop Liminal Minimal (1977) by enlarging the space of projection with two projectors and, taking into account that the vertical strips evolve on a black background comparable to the darkness of the theatre, I was able explore the whole space of the projection with the coloured strips. More recently, in a part of Pictures (1983), I took a filmstrip of the film Organisations and, with an anamophoser that I would move around in front of the lens of the projector, I could deform the strips and move them around the whole room, even onto the spectators. In that case, I proceed by the “explosion” of the components of the image; in Trama and Holon, I proceed, on the contrary, by “implosion” of the image, accumulating on the ribbon – on the filmstrip – a multitude of coloured cutouts. “Implosion” permits, in a way, to dissolve the colour in the object so as to obtain pure variations, which I would call contrary to colour objects, colour lights. The colour becomes “space-light”; it is no longer anchored in the thing itself or in the gelatinous support that fixes it. Because of the cinematographic intermittence, the colour dematerializes. The colour belongs more to the spirit than to the matter. In fact, I reveal here one of the fundamental traits of artists who are interested in colour; its possibility to transcend matter in order to reach the spirit, the mind. Cinema, considered as belonging to the category of fine arts, by essence tends to belong to the mind rather than matter. The luminous blinking of the projection is independent of the gelatinous support undergoing that process. 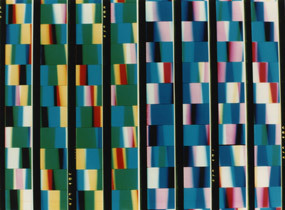 This is why in Pictures I presented a film without a filmstrip; it was a projection of several coloured gelatin filters placed in front of the lenses of two projectors and intermittently struck by the light coming from them. Christian Lebrat is a filmmaker, writer, and director of the publishing house Paris Expérimental.